Many have accused the NAACP of being soft on Sterling. Not only that, Sterling has to hand over $2.5 million for charity — not much for a billionaire, but it’s the principal — and Silver says he’s going to press to get the LA Clippers sold to a different owner. Not only did Silver call the comments “offensive,” but he said they were “harmful,” which connotes something deeper, more serious and more corrosive. Boom. Boom. Boom. 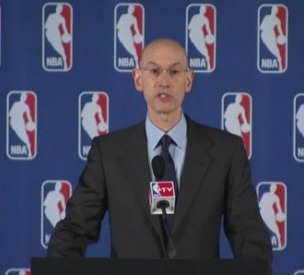 It looks as though the NBA has been much tougher on Sterling than the NAACP has. And some are saying that it could be because Sterling donated money and Clippers tickets to the organization. It should be noted, the NAACP’s national leader, interim president and CEO Lorraine Miller, and the chair of the board of directors, Roslyn Brock, had come out strongly against Sterling on a couple of occasions prior to Silver’s announcement, with Miller announcing on Sunday’s Meet the Press that Sterling wouldn’t be getting that award. “Jenkins’ seeming kid-gloves treatment of Sterling — who has been accused of racist behavior in the past — assumes a questionable air given Sterling’s relationship with the organization,” writes TheWrap. Talking Points Memo also outlines in detail the various discriminatory lawsuits and allegations that have been waged against Sterling over the years. At the same time, Sterling and his charitable foundation, The Donald T. Sterling Foundation, of course, donated $5,000 and basketball tickets to various youth groups. And the Clippers charitable foundation made donations as well. Occidental College professor Peter Drier went so far, in that TPM article, as to accuse a quid pro quo relationship. Others took to Twitter while Jenkins made his comments to say that he wasn’t being forceful enough. This is a good first step. Clearly, as TVOne’s Roland Martin said in TheWrap article, there’s a breakdown between what the national organization expects and what the local chapters believe is appropriate. But more than that, the NAACP is supposed to be the organization taking among the strongest stances on issues of discrimination and civil rights in this country. The mere implication that money can throw them off this mission is a large problem for the group’s reputation and credibility. It must now work to back in front of the issues — this one included — in order to rise back to the level that we all expect.